Jim Barrett will be back at the SDBC in January. Jim will be styling a Robusta Green Juniper. A Robusta Green Juniper is one of the many varieties of Chinese Junipers (Juniperus chinensis). Jim has been a featured speaker at many conventions and has worked for many bonsai associations. 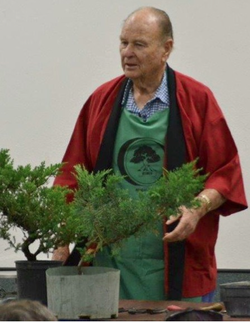 He is past president of Bonsai Clubs International, the first president of Golden State Bonsai Federation, the founding president of the Santa Anita Bonsai Society and currently serves on the American Bonsai Society's board of directors. Jim never had formal bonsai lessons. He attributes his success to the Japanese bonsai experts in Southern California and credits them for the generous sharing of their knowledge and friendship. Robusta Green Juniper is one of the many varieties of Chinese Junipers. This group of Junipers can grow as ground cover or to the size of a small tree or column type habit across many climates zones. More information about this variety can be found in the Monrovia plant catalog.